We realized there is a huge asset most all WordPress site owners are just sitting on: their previous commenters. Here are people that like you and your content enough to go out of their way and tell you about it. They are your base. Properly engaged they can do amazing things for not only your site but also each other. But, they languish. Well let's fix that. Let's make sure they are always seeing and talking about your content. In Settings > Postmatic you'll find a tab named Invite Subscribers. This is where the magic is. 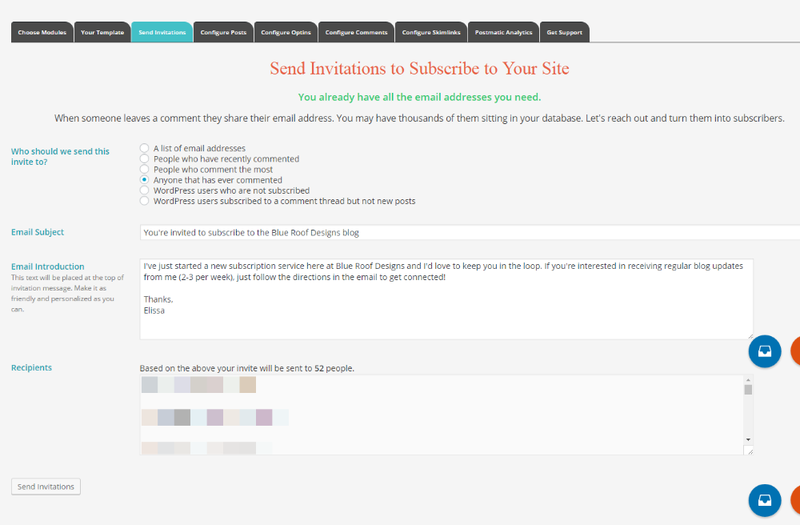 What this screen does is allows you to reach out to your past commenters and invite them to join you once again by subscribing to your site. This means any commenter, all the way back to the day you first installed. And it gets better. Let's say you only want to invite your core people: only those who consistently leave comments, help each other out, and are good friends. You can do that! Use the settings to only send invites to people with more than 10 comments. Or 5. Or maybe just 2. Whenever you change the setting Postmatic will give you a preview of how many invites it plans on sending. Or, let's say you want to only invite people that have recently been active. We've got that as well. Just send invites to people that have commented within the last few days, months, or years. It's up to you. The best part? You can play with those boxes and send invitations as much as you want. We'll never send an invite to the same person twice. No worrying about spamming people. Invite your top commenters, and then anyone that has commented within the last month. It's totally safe. What happens next is that an email invitation will be sent to each commenter and they need to reply to that invite with the word agree (which is much safer than just a link to keep spammers from abusing things) in order to be subscribed to your site. And don't worry, having to send a reply to opt in won't effect your numbers. In our tests about 90% of invited commenters do decide to subscribe to the site. For more information about how to use Postmatic's invitation system, check out the video below.